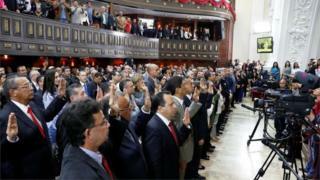 In Venezuela, 18 newly elected socialist governors have been sworn in by the constituent assembly. Five governors from the opposition Roundtable for Democracy (MUD) coalition boycotted the event. They said they refused to bow to the constituent assembly, which they consider illegitimate. The boycott is the latest stand-off between the opposition and the governing socialist party amid a grave economic and political crisis. The swearing-in ceremony followed disputed regional elections on Sunday. The opposition expected to win in a majority of states following months of anti-government protests and amid widespread discontent about sky-high inflation and wide-spread shortages of basic goods. But according to the National Electoral Council, the Socialist Unity Party (PSUV) of President Nicolás Maduro won in 18 of Venezuela's 23 states. The outcome came as a surprise to pollsters who had predicted that a majority of states would go to the opposition. The MUD has alleged that they were robbed of victory through a campaign of dirty tricks. They have published what they say is evidence of fraud in the state of Bolívar, where the government candidate was declared the winner after a two-day delay. They also say that the National Electoral Council, dominated by government loyalists, cannot be trusted. But some opposition candidates, including the former governor of Lara state, Henri Falcón, have accepted their defeat at the polls and blamed it on the demoralised state of their supporters. President Maduro has described the results as a victory. "Chavismo is alive, in the street, and triumphant," he said, referring to the name given to his party's brand of socialism. The result has again heightened tension between the opposition and the government. President Maduro said that governors who refused to be sworn in by the constituent assembly would not be allowed to take up office. "It is my opinion as head of state that all elected governors have to subordinate themselves to the constituent power or face being deposed immediately," he said. The constituent assembly was convened by President Maduro but has been controversial from the start as his critics see it as a way to increase his power. Critics of Mr Maduro say the fact that the constituent assembly is a "superbody" which can overrule the legislative and executive shows their fears were warranted. They say they refuse to recognise the body and will only obey the constitution and the wish of the people. The MUD said it would meet later on Thursday to discuss how to proceed further.